Tortellini Mason Jar Salad. Perfect for lunches on the go, ditch the fast food salad loaded with hidden calories and grams of fat! This week here in Clovis all the kids are headed back to school and the roads seems busy again. Not only are the roads busy but so are our lives, right? 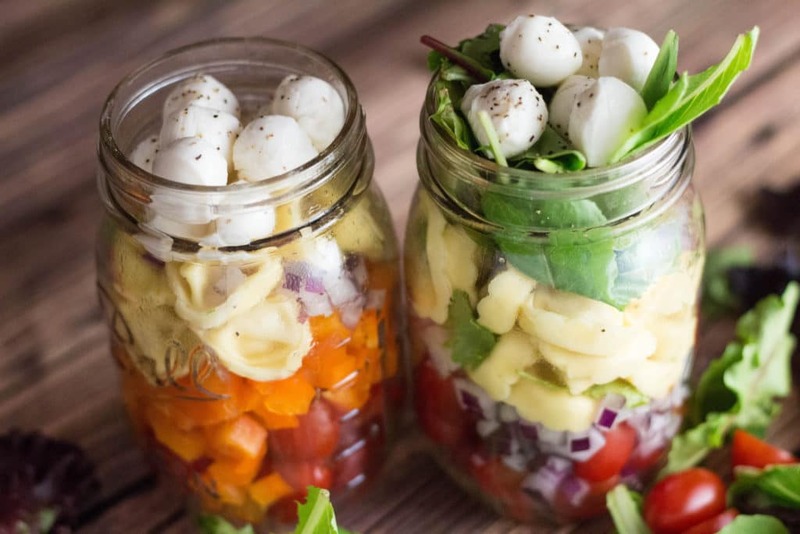 Mason jar salads are such a simple make-the-night-before lunch for your kid or yourself! I like to make it with the dressing on the side so the contents don’t get soggy. For this recipe I actually used Bragg’s Vinaigrette dressing and it was PERFECT. It is made with organic apple cider vinegar and organic extra virgin olive oil and it paired perfectly with these ingredients. I chose simple and fresh. Sometimes there is not need to fancy things up when simple works. 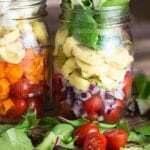 Make a few of these jars, stick them in the fridge, and they should good up to 5 days. Enjoy! Never have time for lunch? 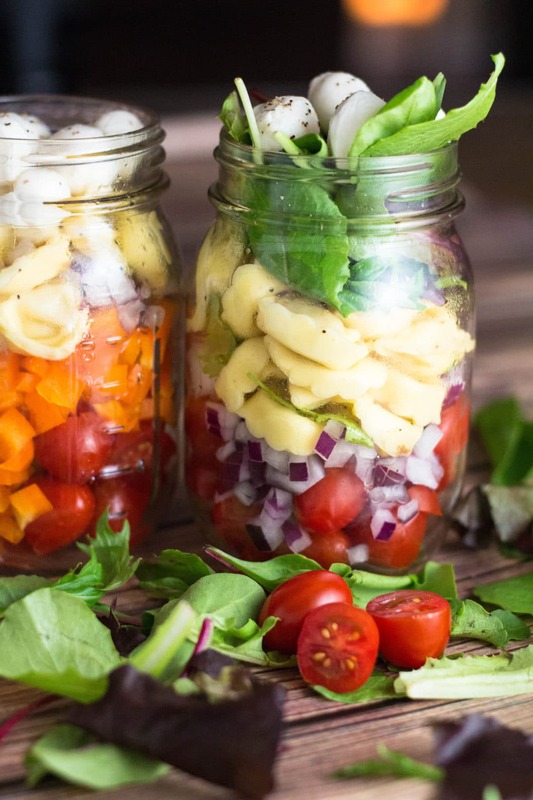 Prep ahead with these easy tortellini mason jar salads to ensure a nutrient rich meal! Once tortellini is cooked and cooled, I tossed mine with a few tablespoons of dressing, 1/4 cup of the red onion, and a little salt and pepper. 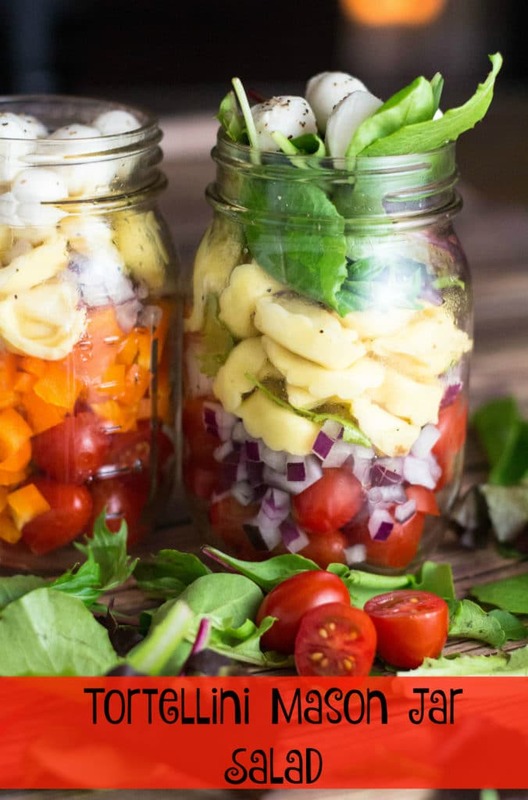 Then start to build your mason jars. You really can build them however you would like. I like to put the lettuce on top, so when you pour into a bowl the lettuce is on the bottom. I layered both of mine a little different as you can see: tomatoes, onions, bell pepper, tortellini, salad and cheese. Add additional dressing on when ready to eat. Enjoy! Tawnie Kroll is a Registered Dietitian Nutritionist (RDN) and loves making cooking easy and simple yet nutritious and satisfying. She enjoys indoor cycling and yoga, a good glass of red wine with friends, and of course anything to do with being in the kitchen! Subscribe by email for updates, and be sure to follow her on Instagram, Twitter, Facebook and Pinterest for more recipe inspiration! This looks delicious and will try soon. We used to live in Seima Ca so want to to follow you more than ever! Hey there! I’m Tawnie. Thanks for stopping by my little space on the Internet. I live in Fresno, CA and I am a Registered Dietitian Nutritionist (RDN). I am a huge lover of cooking and baking, a healthy recipe creator and fitness enthusiast! You can catch me either blogging or instructing at BEYOND Pilates! Follow along for recipes, healthy living/fitness tips, and practical scientific evidenced based advice to help you improve your health and well being! "Click here to learn more!" Tawnie is the blogger behind Kroll’s Korner. She is a huge advocate of healthy eating and enjoys creating nutritious recipes for others. She loves supporting her local community in Clovis, CA in any way she can. Whether it be cooking, blogging, staying active, or enjoying time with friends and family, Tawnie is always up to something new and exciting. Thank you for following!